It’s a holiday weekend so why not take it over the top. Camping out? This is a great breakfast especially with our farm fresh eggs. Dinner guests? Switch out the muffin for some rolls or artisan bread. Try flavored bacon and use pork, bison or lamb for your burger. Add mushrooms and cheese. It’s up to you and we have it at the Market! Gently mix together the beef, bacon, and ½ teaspoon each salt and pepper with your hands in a medium bowl until just combined. Form the beef mixture into four ¾-inch-thick patties. Use your fingers to make a shallow well in the top of each patty (this will prevent overplumping during cooking). Grill the burgers until an instant-read thermometer inserted in the center registers 140° F, 4 minutes per side for medium-rare. * Grill the English muffins, split-side down, until toasted, 10 to 20 seconds. Heat the oil in a large nonstick skillet on the stovetop over medium heat. Crack the eggs into the skillet and cook, covered, for 2 to 3 minutes for slightly runny yolks. Season with ¼ teaspoon each salt and pepper. 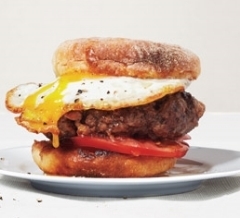 Stack the tomato, burgers, and eggs between the muffins.